Knowing whether you should assign your students work as a Task or an Assessment is crucial to using Education Perfect effectively. The difference between an Assessment and a Task is that an Assessment is designed to be sat once, under exam conditions. Conversely, a Task is an activity where the student can practice the lesson multiple times, over several weeks, and can come back to it when necessary. Below we will identify the different options and features available within both. Tasks are designed for students to learn and revise content. They are perfect for assigning as homework for students to complete or as activities during a lesson. You're also able to view in-depth reports on your students' task progress. You can set, edit and review tasks by navigating to the Tasks & Homework section of your Control Panel. When setting a task, you have the option of Peer Review mode. This mode allows students to see and give constructive feedback on their peer's answers. To find out more about Peer Review, check out this article. There are various features which make Tasks ideal for learning purposes. For example, the Live Feed will enable a feature that lets you know if students are currently working on the task or if they are distracted and moved off task (e.g. opening up another tab). The next section allows you the option to activate or deactivate Dash for your students. Education Perfect Dash gives students a goal to work towards and it's an engaging way for them to review the topics that they have finished working on. The Optional Settings is the last section before assigning the Task. You're given the option to include when you would like the attempts to be recorded from as a part of the completion data. This allows you the option to include the students' attempts after a certain time you specified. You will then prompted with the option to be emailed a Completion Summary Report of the task if you would like the students or students' parents to be emailed. You can also be emailed a report of which students or parents have been emailed a task notification. Lastly, you are given the option to Disable question timers or to Disable Cheers while doing this task via ticking each option accordingly. Disabling the question timers will mean that your students will be able to take as long as they need to answer each question. Disabling cheers will mean that your students will not be able to send each other cheers while completing the task. Once you have confirmed your options, proceed to clicking Assign Task to finalise the Task. Our Assessment feature is set up to help you run assessments the way you want to — whether you're running an 'open book' test or you want it to be sat under exam conditions. They are also great for gaining an in-depth look into how well your students are doing in certain topics and aggregate their strengths and development areas. Students will then answer the assigned questions under exam conditions, they will have a time limit, and will not see the correct answers until marking is complete. To set, edit, or review assessments, navigate to the Assessments section of your Control Panel. When you click New Assessment you will be prompted with the option to select one of three options: A Quick Test, Pre-built Assessment or to Create your own. A Quick Test is an assessment based on existing learning material (e.g. Vocabulary Lists or Smart Lessons) and contains a random selection of questions from the list(s) you selected. There are a few options available to customise the assessment according to your own specific requirements. Under the Assessment Conditions section you have multiple options available to allocate a time requirement for the assessment to be completed, how many attempts the students are allowed, whether an access code is required, and whether or not you like to monitor when students are going on and off task via the Enable Full Screen Monitored Mode option. Under the Results section, Quick Tests also allow the option to withhold student results until you would like to release them. This feature can prevent students from sharing answers with other students who may not have completed the assessment yet. 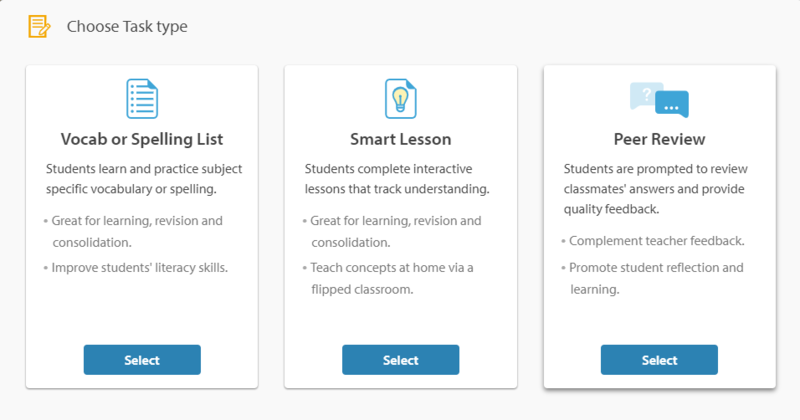 The Targeted Remediation section will allow you to either automatically assign recommended homework tasks based on your students' development areas, or manually review the recommendations yourself. You will also have the option to limit the amount of work assigned to your students based on the hours it will require or the number of lessons. The last section before assigning the Assessment, under Optional Settings, you are given the option of whether or not you would like to be emailed a Summary Report when students have completed the assessment, if you'd like the students or parents to be notified via email, or if you'd like a report emailed to you of which students or parents have been emailed. Once you have customised the assessment settings to suit your requirements, proceed to clicking Set Assessment to confirm your changes. You can also assign Pre-built assessments to your students. A pre-built assessment is an assessment based on a past exam or diagnostic test, or one that has been created by a teacher in your school. Pre-built assessments come with advanced marking rules and can include recommended remedial content. The third option given when you click Set Assessment is Create your own. After selecting this option, you can create your own custom tests to run online. This enables you to better streamline the marking process and even gives you the option to automatically mark work where suitable. For more information on how to do this, you can read through our help guide here.